The swimming pool design is one of the most important decisions you can make, as everything from the construction to the required level of maintenance is affected. And it’s even more important when you consider the fact that of all the things associated with your pool, this is the one thing that cannot be changed. As you think about what you want, you will also want to take into consideration where in your yard you want to put the pool. Some things to take into consideration when placing a pool in your yard. Water runoff from your house & neighboring areas. Berms & waterways can be built to divert water around the pool area. Drain tile can be installed to your rain spouts to divert water around the pool area. Visibility of pool from inside house or deck. Location of pool equipment pad usually goes near the house. Once your specific pool construction site is selected, this may help to drive the pool design. Depending on the space, it may become obvious that a smaller Kidney or Lagoon shape would fit best or tie in with existing landscape or a smaller rectangle with a automatic cover option. Or maybe you have plenty of room and decide to build a large figure eight or L-shape. There aren’t any wrong or right answers here, it is all up to you. If you want a pool with a diving board – this would be considered a Traditional deep end hopper bottom pool. A diving board requires a larger pool: Rectangle, L-Shape, or Larger Free Form pools are good examples. If you prefer a pool without a diving end: A sport bottom or level bottom pools are great for volleyball, basketball or other pool games. These types of pools are more popular today, providing more playable, usable area, but these pools are non-diving swimming pools. Shape & size will determine if a pool can be a Traditional diving pool. Level – This pool doesn’t have a deep end, in other words, the depth if the same throughout the entire length of swimming pool. This might be a option if you only want the pool for laps or building on a high water table area or some other geographical anomaly which won’t allow the pool construction to go deep. 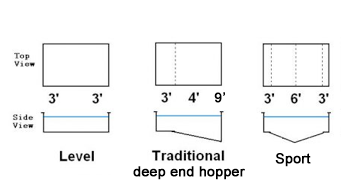 Traditional –Deep end hopper. This pool would be what you would normally think of when you hear “in ground swimming pool”. It has a shallow end, which typically includes the stairs into the pool, and opposite to this a deep end, which may hold a slide or diving board. Sport – This swimming pool design is becoming increasingly popular, as it has shallow ends on both ends of the pool, and is deep in the center. In a traditional pool, if you string a volleyball net across the center of the pool, one team will be playing in shallow water while the other team is playing in deep water. With a sport pool, the net spans the deep section, and both teams are playing in the same water depth. It is still possible to have a slide with this pool, but the pool builder must be careful to angle the slide correctly so that it dumps the slider into the deeper water and allows for any traveling they will do once they hit the water. By adding various features, you can give your pool more personality than you thought possible. Waterfalls and walls of water can give it a tropical feel. Slides and water fountains can make it feel like a water park. Stretching a volleyball net across the pool will make it exciting for sports enthusiasts. Adding colored underwater lighting will provide a touch of comfort and mystique. An Automatic safety pool cover can add another layer of protection and saves up to 70% of heat loss. Many of our customers wish to use a pool for exercise, and a smaller pool will not let them do laps. But, there is no need to fret as there is an easy solution to this. We have a solution with our Exercise Pool which allow you to “swim in place against an adjustable flow. Lastly, everyone knows that it is an absolute necessity to keep chemicals in your pool to reduce bacteria and algae growth. There are many choices in this arena, which we will discuss with you. Some are high maintenance, but offer benefits of being less harsh to the skin and suits, others are more traditional and less costly. Please see our Maintenance and Services sections for further details. Maintaining your pool is very important. You have just spent a lot of money on your pool, you will want to take care of your investment. It is quite simple and takes very little time and maintenance to take care of your pool. Let Us Worry About It! If you simply don’t want to worry about doing the ongoing maintenance, let us take care of it. Having us service your pool, will guarantee that we know the ins and outs of your pool and will be there if anything needs attention.